A broken hand doesn't have to lead to weeks on the couch waiting for your bones to set. Take steps to retain your lean muscle mass and cardiovascular health while waiting for your doctor's clearance to resume all activities. 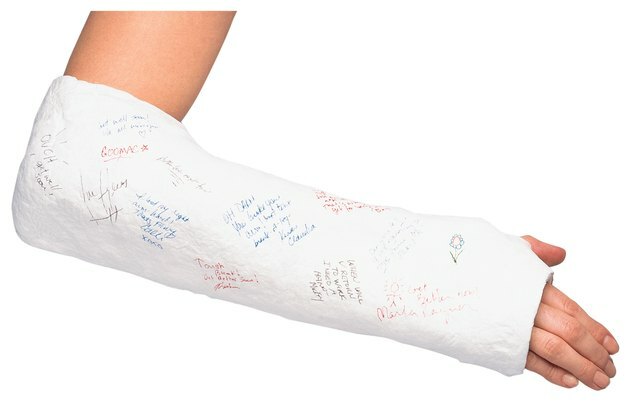 There are myriad forms of hand fractures, casts and treatments. Your level of exercise and ability will depend on your physical health at the time of the break and the stability of your hand fracture. Talk to your doctor, surgeon or physical therapist and ask about your limitations. Your hand and arm may be in a cast or splint for 3 to 6 weeks as the bones knit back together. Develop an exercise plan that doesn't include contact sports or high-impact aerobic exercise, which may jar and change the set of your healing bones. Changing the position of your hand while it is healing may lead to a permanent deformity. Take any pain or anti-inflammatory medications as ordered prior to your first exercise session. The exertion alone may trigger discomfort in your healing hand. Warm up your uninjured limbs with a 10-minute march in place. Do not swing the broken hand around, but keep it close to your body and protected while warming up and exercising. Work out using your other limbs. Try brisk walking, recumbent bicycling or adapt a workout machine to work your other three limbs. You can use the elliptical, stair climber or rowing machine with your good hand and legs. Talk to your doctor if you perspire heavily during exercise, as this moisture could build up inside your cast, if you have a plaster, non-removable cast, and cause damage to the skin tissue or facilitate fungus growth inside your cast. Stop any exercise that causes pain in your injured hand. Do not exercise without your doctor's permission.